You get what you pay for. [Jkx] wanted to see how a USB to RS232 cable could be sold for just $1.70 and found out that it’s not actually RS232 compliant. The cable communicated as TTL levels, not the 12V expected of RS232 (although it can handle 12V incoming). He didn’t really want to use them for their intended purpose anyway. By betting rid of the DB9 plug and reusing the enclosed circuit board he now has a really cheap way to interface a microcontroller with the Universal Serial Bus. He worked out a couple of short subroutines that take care of receiving and sending data over the connection. ← Keypad door lock, better than last years keyfob? Cheap and easy, just how I like my prototyping. since Uarts are almost ubiquitous on embedded processors and most PC don’t have serial ports now a days… hasn’t just about anyone who messes with micro controllers done something similar? This is pretty lame IMHO. I did this too! :-) also did this with XBee-to-USB then had XBee-to-µController on the other end. The USB provided power to the XBee after running through three 1N4001 in series to knock to voltage down to 3.3ish. Tell me if I’m wrong, but a search for ‘usb’ and ‘ttl’ bring up some pretty cheap usb-to-ttl modules already; I think finding one with pretty mature drivers would be the best bet (prolific?). Though not all uCs come with uart, and even fewer USB. A max232 connected to your uart would work. The values are 3v to 15v(logic 0) and -3v to -15v(logic 1) for true RS232. The above values are for data, the control lines are the opposite -3v to -15 for logic 0. Congratulations @Dekar, you are now in the lead for the “Douchebag of the Thread” award. Will there be any challengers? Everyone together now… Been There Done That! I think the point is that this was this guys first time working with a serial port and found a really cheap way of making it work. If that’s the case than great job guy! I’m not following why he could not use the UART in the Arduino though. You can buy USB – UART adapters from ebay. Here’s a forum post about 2 styles, one with a cable and one with header pins. The second one is great because it will supply 5v or 3.3v to power the circuit. > You know, if you look for them, many modern Mothers still come with serial ports. What you saying about my mother? Don’t quite understand the negative reaction myself. Sure, it is hardly new or used to those of us who have FTDI 232R, prolific 2303 and silabs CP201x chips, cables and modules littering the floor and our own CDC-ACM stacks written in assembler just to up the “snob” factor. What I found interesting was the PRICE such a USB-RS232 bridge could be had for. This was an eye opener as my standard rule of thumb was $20USD. Also the fact that some cheaper cables do NOT have any true RS-232 level shifting but have the inverted polarity was completely new to me and this will really change some of the advice I offer on some of the electronics forums. One other thing I would point out is that there are some micros that allow the polarity of the UART to be inverted. This hack then would allow the hardware UART to be used without having to add a “MAX232” etc. Many of the newer PIC chips have this feature. All in all, I found it an interesting hack. I wasn’t aware that they weren’t 100% compliant! This might come in handy while servicing some of the 20-year-old and over industrial PC systems that have started finding their way to my bench at work. Soo, as someone who hasn’t been there and my soon be doing that I say THANK YOU! Good information and a cool hack. @strider_mt2k, the cheap (around 2$) aren’t RS232 compliant, but I think the more expensive (~10) are. rs232 is +/- 15v, not 12v! dekar, of course more powerful (and more expensive) uC’s do have some kind of usb or are able to handle software implementations. but if you are working with a controller that has only 4kb of rom and not that many resources to use native usb is not an option because you dont want your controller to do usb and then have no resources to do a real task. so this is a cheap and easy solution to add (kind of) usb support to a project. i’ve got one cable like this (bought it very cheap from china) lying around that didnt work for rs232. i thought it was just crap and doesnt work at all, but now i might try it with ttl level devices. nice. It’s a DE9. A D-subminiature plug with an E-size shell and 9 pins. It depends on the chip and on the configuration. The elcheapo COB chip they used in his converter might only be ttl, but a pl2303 can do 3v, 3.3v, 5v, and 12v without needing an extra chip, just by how one pin is wired (to gnd, v+, or floating. Cell usb/serial cables tend to have pl2303 chips wired for 5v but can be modded. Basically he invented an arduino, but uhm didn’t somebody already invent that? For classic 8 bit machines 5v TTL is better anyway. These $2 USB UARTS do in fact report themselves as PL2303. I found to get the TTL levels back round the right way, the simplest way to do it is with a couple of logic level FETs. The tx line needs no pull-up resistor and the rx line only needs one if you can’t get your microcontroller to use it’s internal pull-up. Not a problem with AVRs, but is with some ARMs. I use the FTDI FT232R chips exclusively, there is nothing that comes close for the price. They are dependable, cheap, and have excellent driver support. Provides 3.3V from 5V for other devices, has internal security for dongle devices, hardware xon/xoff, and supports, 1.8, 2.8, 3.3 and 5V logic .It also does RS422/485 in addition to RS232 in the same chip. It also doesn’t require any external parts for 95% of uses. Arduino doesn’t use the atmel chips with native USB support. The USB is supported by the FTDI chip on the board. There are some real asshats on here. A request to HAD though. When doing posts like this it would help if you spend a bit of time looking into it yourselves and then presenting more detail and a bit of an overview. That would stop people moaning and make HAD a much more useful resource. ATM you basically just post a bunch of links every day. Anyone can do that. Electronics Lab at least filter their posts so we only get the really good stuff that actually presents something new. I’m not saying be just like them, but if you did more editing and editorial I think it would improve HAD a lot. On the subject of USB->RS232 one of the best options is a Nokia CA-53 cable. They all use the same PL2303 chip (drivers built in to Windows 7 and Linux) which is a pretty good little device. It is 5V tolerant even though it runs on 3.3V. The DA-53 cables usually have everything contained in the USB end and you can either crack it open and solder on directly or cut the Nokia end of the cable off and use that. With AVRs you might not even need a level shifter, especially if all you want to do is receive. The AVR’s inputs have diode clamps anyway. In fact Atmel have an app note where they connect 240V mains directly to a pin with only a 1M resistor to limit the current! A similar resistor, say 10k, works well with RS232. Many USB converters and motherboard serial ports will work with TTL levels for reception too so you may get two way comms for the price of a couple of resistors. I think a lot of people who suggest alternatives to this (FTDI chips, phone cables, etc) are missing the point. This USBSERIALMCU adapter is $1.99 on eBay (shipping included), and is one of the cheapest ways to get a microcontroller to talk to a PC which might not even have a serial port. Appreciate it for what it is. Honestly, I’m starting to wonder why we ever bother with serial anymore. I’m beginning to look into ARM based processors, and I’m finding that they all have builtin USB and its not that tough to use. You can get 55MHz ATMEL SAM7s processor for $2 in an easy to solder package (SMT soldering is NOT hard! I just learned it from watching youtube videos). There are already EAGLE footprints for some nice mini USB connectors in the SparkFun Library, and there are a few Atmel libraries that contain the SAM7 parts on the EAGLE website. Then you can send your PCB off to batchPCB for a few bucks and get yourself a very nice, easy to use board. There are some examples on the web for how to start off with them just acting like a USB COM port, so you can still code for the PC the same way, but there’s actually less stuff to solder. USB only requires two resistors, and they usually recommend one cap on the power line. Those SAM7 ARM chips don’t have much to hook up in EAGLE and you can get an example schematic from OLIMEX. I haven’t had a lot of time lately but I’m pretty much convinced that I’m ending my use of 8 bit processors as soon as I start my next project. 32 bit just isn’t that complicated anymore. Maybe I’ll write a tutorial. I really want to teach! Don’t wait for that though, just follow my advice here! Oh! 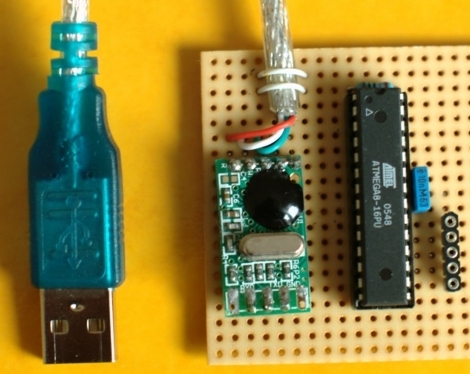 ATMEL’s USB microcontrollers don’t require a programmer either. You can program via USB out of the box! @Scott A Nokia cell phone cable is ~$3. It’s output is low voltage TTL which means it can be used with 3.3V and 5V signals. Plus, it’s output isn’t inverted, so you can use the microcontroller’s normal Rx and Tx pins. This hack requires you to have an off-spec USB to RS232 dongle, use up two pins on your uc, and write your own serial functions. Furthermore it requires you to give money to manufacturers of a device that doesn’t meet the specifications, thereby encouraging them to continue to do this. If you can get one the MSP430 launchpad has exposed TTL serial ports that can probably be hooked up to something completely different. And for slightly more hacking one can use an ATtiny w/vUSB. This is exactly the same concept as the CA-53 cable. Four connections make it work – power, ground, Tx and Rx. If the board is powered already, don’t connect the power lead.